We remember 1882 in 2017 with fervor and resolve. This is another watershed year in American history. 2017 will be remembered by how we respond to the edicts of President Trump—the travel bans, orders for a wall against Mexico, the barring of refugees, and the immigrant raids in our communities. Our cause is to resist all the Administration’s rulings that are unconstitutional, inhumane and wrong. 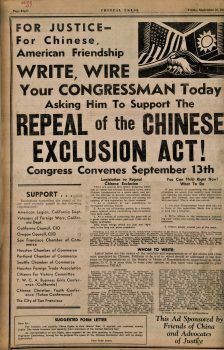 The public’s acceptance of immigration restrictions stem from racism institutionalized by the passage of the Chinese Exclusion Act of 1882. Deep-seated nativism was brought to the surface and legitimized for the 21st century by candidate Trump’s campaign slogan, “Make America Great Again,” with the underlying message of make America white again. In January 2017 men, women and children from nine countries were abruptly refused entry at U.S. airports because of their ethnicity and religion. They had valid visas and some had green cards. 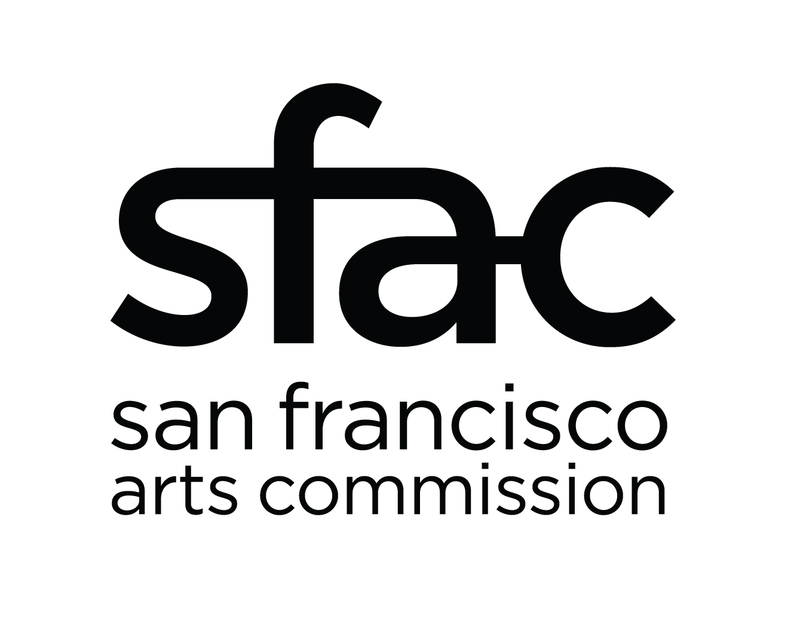 There was world-wide surprise that something so un-American could happen, but to Japanese Americans recalling Executive Order 9066 and Chinese Americans remembering the myriad of exclusion laws, this was a nightmare recurring. My maternal grandmother, Mrs. Lee Yoke Suey, was caught in a travel ban in January, 1924. 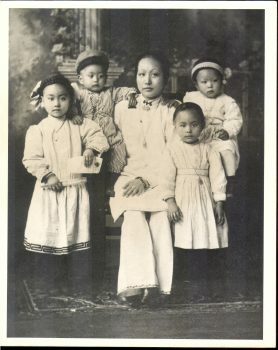 Born in China, she was the widow of an American-born Chinese and denied re-entry into the United States by the Board of Inquiry at Angel Island Immigration Station because “she is now without status by reason of her husband’s death.” She was separated from her American-born children and detained in the immigration barracks. 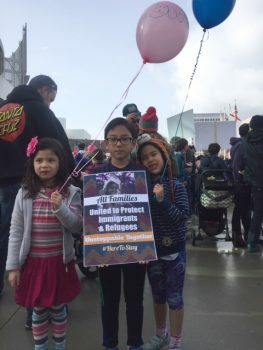 Lawyers appealed her case before the Ninth Circuit Court of appeals and after fifteen and a half months she was finally released to join her children in San Francisco. In 2017 there was swift action to rescue those barred from entry by President Trump’s executive order. Lawyers working pro bono rushed to airports and set up legal aid stations. Judge James Hobart of Washington was the first to block the immigration order. President challenged the “so-called judge”, but the suspension of the ban was upheld by the unanimous decision of the 9th circuit court. President Trump was handed his first appellate court defeat. This showed to all he was not above the law, and his orders are subject to legal review by judges and the people. A second travel ban involving six Muslim countries was issued, and was halted by the ruling of Hawaii’s Attorney General Douglas Chin, who declared that President Trump violated the constitution with the redrawn executive order. More cities and states joined in to oppose the immigration ban. As the Administration relentlessly issues new travel bans and immigration restrictions, so the judiciary must keep up their challenges, with people’s support behind them. It is critical now more than ever to remember that in the 19th century Chinese in America were actively involved in the fight for civil rights, and their victories are what makes America great. The case of Yick Wo vs Hopkins 1886 is one of the foundations of our civil rights laws, cited thousands of times, and it is all the people who are protected and empowered by it. Bearing the mantle of our ancestors who lived in the shadow of exclusion, we are prepared for the struggle. We’ve been here before, and we have the means and the will to resist. Each and every one of us can act to make a difference. We can make calls and write and use social media. We can march and we can join the ACLU, and connect with organizations who show solidarity with Muslims and those who defend immigrants threatened with deportation. The fight is not in the streets but in the courts, a battleground we know well. We are in this for the long haul. Everything is at stake. We stand with you, the detained and disenfranchised, we fight for you the beleaguered immigrants, the mothers and fathers torn from their children, we fight for our communities, we fight for America. Remember 1882.